Let the countdown 'til Christmas continue with DAY 4! Rewind time 26 years and we'll fall back to December of 1989 - an age when print magazines were thriving and the word "internet" confused most people. 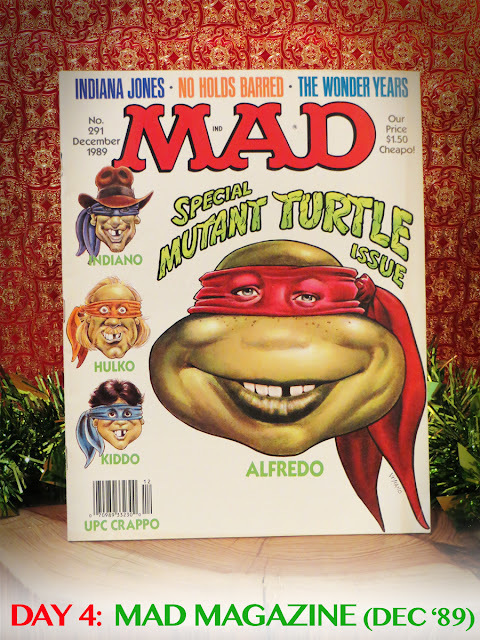 In that December of 1989, Alfred E. Neuman mutated into a Teenage Mutant Ninja Turtle and graced the cover of MAD Magazine. The artwork is a special kind of ugly - an 80s ugly that encapsulates all the trends of the decade. In its golden era, landing on the cover of MAD Magazine was like winning an award. It was a honor when your celebrity status or trendy power nabbed you the spot. Actors, musicians, movies, television shows - nothing was off-limits. It was a fun platform for mocking pop culture. 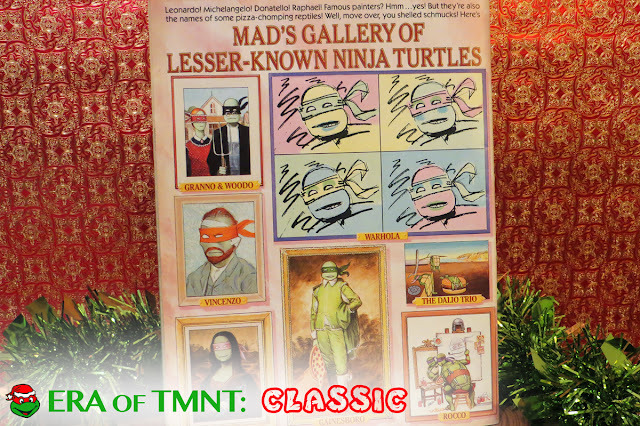 And in December of 1989, TMNT earned their spot. Does an issue of MAD Magazine from December of 1989 make a good gift? The issue is a bit of a letdown. Aside from the front and back covers, the rest is barren of Turtle Power. There are no other TMNT-related gags in all 48 pages. This is such a bummer after the front cover displays such promising potential. At least the back cover gives us Turtle fans a few more, mutant-related laughs. As for the pages within, I'm sure kids of 1989 were happy with the pop culture jabs. There are so many familiar favorites from the past that get the goofy treatmeant - Pee-Wee Herman, The Wonder Years, Indiana Jones, and even Hulk Hogan's No Holds Barred. 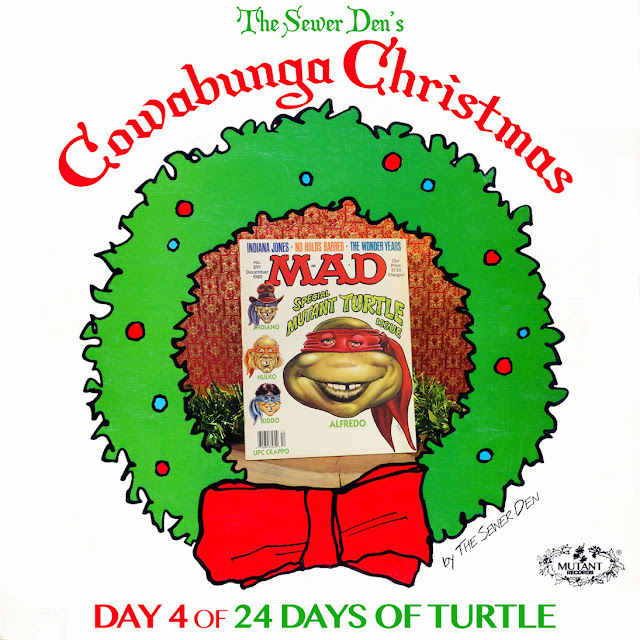 Check back tomorrow for DAY 5 of Cowabunga Christmas! Can't wait until then? Take a trip with the Ghost from Christmas Past to see what The Sewer Den put on display on December 4th in 2013 and 2014.